The 4th DMZ International Documentary Festival, an event with the aim of becoming Asia's leading documentary festival, has unveiled this year's official poster. The festival will open on 21st of September and last for one week in Paju Book City in Korea's Gyeonggi Province. Flowers are the theme of this year's official poster. The strong image of flowers and the orange festival logo are initially attention-grabbing. But when you take a closer look, you'll see that it's actually an image of a soldier in camouflage holding a gun, playing on these contrasting images. The design is by leading Korean media artist LEE Yong-baek and is entitled ‘Angel Soldier.' It's based on his idea of a world full of flowers and what would happen to soldiers in that kind of world. The motifs are flowers and guns, soldiers and angels, and of course war and peace. These contrasting images came together to put across the idea that even during a war, there is still a sense of hope, just like a flower that grows on a battlefield. 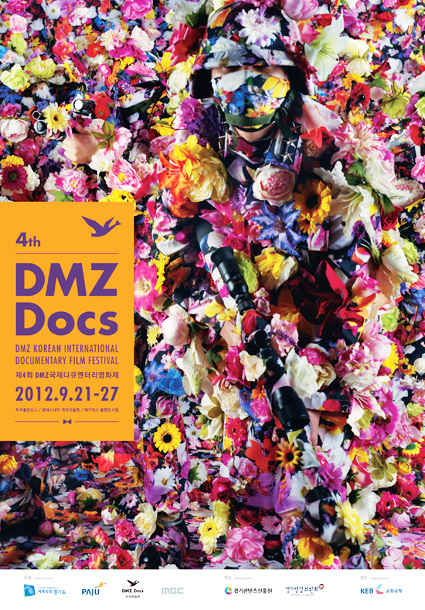 The DMZ International Documentary Festival, held in the DMZ (de-militarized zone) area that holds the most painful memories of Korean history, is an event that seeks to promote peace through the screening of documentary film. Thus this year's official poster fits the aims and tone of the festival perfectly, and LEE's work was an obvious choice. The poster is an expression of accepting pain instead of denying its existence and spreading the message of hope. This year's festival will screen 115 films from 30 countries and alongside the screenings there will be many side-bar events, making it an even more enriching and diverse edition. For more information, visit www.dmzdocs.com and www.facebook.com/dmzdocs.